Soldering the Components to the Printed Circuit Board. A solder joint involves using a chemical wetting agent (the rosin flux in the core) and melted metal (the 60% tin and 40% lead alloy) to glue together two items with a joint that is both electrically conductive and mechanically sound. Ordinarily, this would not be a problem—with enough heat, you can easily solder or even weld the metals together. The difficulty is getting a good joint without toasting the immediately adjacent heat-sensitive electronic components or insulation. This requires optimum conditions for soldering. The parts have to be reasonably clean and free of corrosion, or the solder will not flow smoothly and adhere to the surfaces. Most electronic components come with leads already reasonably clean and pre-covered with solder ("tinned"), and thus need no further attention. Make sure no residual etch, etch resist, or corrosion is on the PCB (printed circuit board), and that the PCB is free of wax and oil. Sand, wire brush, scrape, use thinner, use rubbing compound, or use wax/silicone remover at will. If you can’t get a part clean and free of corrosion, throw it away. Your soldering iron will also burn the rosin flux in the solder, and this stuff will interfere with a joint as well. Periodically "tin" the tip of the soldering iron so that solder flows over it, then wipe it clean with a damp rag or sponge. If the flux reliably burns (turns brown or black) on the soldering iron in the few seconds between wiping the iron tip and starting the solder joint, the iron must be too hot. Since you will be using minumum heat to apply the solder, make sure that both sides of the joint in fact get enough heat to activate the flux and let the solder melt and flow freely. Press the tip of the soldering iron against both sides of the joint. You can touch a bit of solder to the interface between iron and PCB as well as iron and componant lead to hasten heat transfer, but most of the solder should be applied not to the iron tip but to the componant lead or PCB copper. You will know that the temperature of the iron is right when the components briefly cool the very tip of the iron below the melting point the solder—for a fraction of a second the solder will stick to the junction between the component and the iron tip. For the 1-2 seconds required to make a solder joint, it goes ….iron tip and solder to junction of PCB copper and componant lead, solder just starts to melt, then apply the solder to to the other side of the joint. 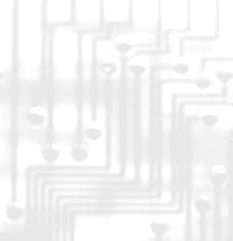 In a tight circuit board, since componants can be heated several times while installing them, put in the least sensitive (usually the cheapest) components first (like resistors), intermediate sensitivity next (like capacitors), then more sensitive (transistors, diodes), then integrated circuits. For very sensitive or expensive components, consider soldering in a socket. If you are joining a tiny component to a beefy component, start by briefly heating the larger component first, then both, as the smaller component may overheat before the larger is hot enough. A small alligator clip or a square of damp cloth on the component can slow heating as well. If the componants are close or small at all, using small calliber solder can help much with this process. I use 0.031 inch diameter solder, which a little bigger than the smallest stuff that RadioShack sells. Acid flux solder makes a great joint, but corrosion later is a serious problem, so stick with the standard "rosin core" solder. A good solder joint is smooth, shiny, and concave. 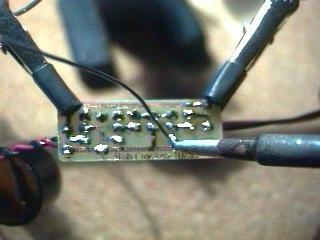 Note that solder has a brief delicate phase as it cools. If you move the joint while it is cooling, the stuff crystalizes with a sort of amorphous pattern and the strength and conductivity of the joint is compromised. The easiest way to remove a componant from a circuit board is to quickly heat up the solder joints, and firmly pull the componant out with a pair of needle nose pliers while the solder is still liquid. You can then redrill the holes in the circuit board through the remaining flux and solder and easily solder in a new componant with little heat exposure to the rest of the board. If the componant has more than two or three leads (for example with integrated circuits), you probably will have to laboriously remove the solder from each lead and gently pop each lead loose. Apply a short segment of "desoldering braid" across the joint, and press the soldering iron through the braid to the joint. Resist the temptation to scub the board with the iron and braid, as you will probably pry loose the copper pads and traces from the board. As the joint solder melts, it will wick into the flux-containing copper braid. You may have to repeat the process several times and from several angles to get enough solder off to pop out the component. Your efforts will be rewarded with a brownish scum of burned flux on everything, but take a little 99% isopropyl (rubbing) alcohol on a paper towel, and the flux rubs away without too much difficulty. For joints between wires, make sure that the joint is mechanically sound before solder is applied. I’ve seen wires soldered by laying the two wires together and applying solder, but the solder can crack and peel back under mechanical stress like old glue. Try to twist the wires together first, then solder. 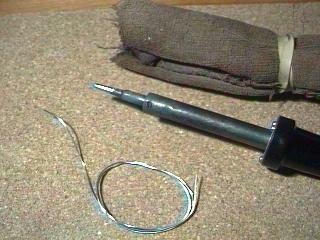 If you are using solder to attach a clevis to a push-rod, try to crimp the clevis first, then solder. I resisted buying a "helping hand" for years, propping the PCB up between tools and other items on my desk. I finally bought one, and the two adjustable alligator clips on little ball-jointed arms complete with a magnifying glass on the thing really do make the job considerably easier, and I’d recommend one heartily. RadioShack sells one, "Extra Hands with Magnifier" part 64-2063 for $9.99, but most hardware stores carry some version of it. I put a short segment of heat shrink tubing on each upper and lower jaw of alligator clips to keep them from scratching the components. To solder batteries together, the best method is to use the batteries with solder tabs already installed, and only solder the tabs together. The large mass of a battery requires applying considerable heat to successfully solder a wire directly to a battery endplate/terminal. Rechargable NiCad batteries also have a pliable seal at one end to allow escape of gasses generated during recharging. The temperature required to solder is well above the temperature required to melt and damage the seal—solder directly to the battery terminal and you definitely damage the battery. A damaged seal means the electrolyte of the battery dries out prematurely and the battery fails before it is due. That said, how can you solder wires to a battery and minimize damage by minimizing heat. First, remove a patch of the corrosion resistant coating from the battery terminal with, say, a little 600 grit sandpaper. Solder will flat not stick otherwise. "Tin" the tip of a hot soldering iron, and rub the flat portion of the iron tip briefly on the battery terminal to "tin" the spot of the future solder joint. If you are making a battery pack, tape the batteries together. Use a spot of tape to hold a pre-tinned wire in place on the terminal. Press the wire onto the terminal with the iron with a little extra solder to make the joint. You can remove the tape and apply final tape or shrink wrap as desired. Absolutely do not solder directly to very small or "button" batteries. The contents will expand in a non-expansile container, and can explode, making a fine mess of corrosive material and possibly blinding you. I’ve been using a good quality but simple Weller SP-40 40-watt pencil-style soldering iron for years. When it breaks, I’ll buy a nicer, adjustable heat model with a stand and sponge. For now, I can loosen a set screw on the tip, and pull in or out the tip to adjust the heat to a considerable degree—not the case with those cheesy low-budget RadioShack models. Generally, smaller components need less heat for a good joint, and reducing the heat of the soldering iron gives you a little more working time before the component overheats. If I need to do really fine work (like modifying a micro servo or a receiver), I wrap a piece of 16 or 18 guage copper wire around the tip of the soldering iron with the end of the wire extending forward as the new, smaller, cooler tip. The larger pistol-grip style 100 watt solder guns are impressive (particularly the way they buzz when you pull the trigger), but are difficult to handle and can get way too hot for PCB electronics work.